I believe you met my dear next door neighbor last month, Ms. Hilda Bjorn. Such a sweet old soul. I worry about her. A couple of men have been coming around and trying to…but wait, I need to introduce myself. My name is Anderson Fear. I’m a professor of philosophy at the University of Minnesota. I live close enough to bicycle to work, which is why I bought this house. When the weather is nice, it’s a pleasure to bike. I also have a car, but I try not to use it too much. When Ms. Bjorn has trouble with her insulin port, I drive her to the hospital. That doesn’t happen too often, but when it does, she asks for my help. She reminds me of my grandmother, who left this earth a few years ago. What was I saying? Oh yes, those men that have been coming to her house, trying to get her to sign their papers. Shady characters, if you ask me. I know you didn’t ask, but if you did—now that big tabby cat is there again, Quincy. He gets loose and comes straight to Ms. Bjorn’s porch because she feeds him. He seems like a glutton. Ms. Bjorn says I’m absentminded. That’s what my dear grandmother used to say, too. But I need to find out what’s going on over there. I wonder if that guy who’s running for mayor knows about this. He handed out pamphlets on campus, but I don’t know. He doesn’t look like the trustworthy type. It’s a relief that Julie Larson, the lawyer, is looking into things. Guess I’ll go over and say hello to Ms. Bjorn and Quincy. His owner will be here for him soon, I’m sure. check Janet’s webpage for preorder links. When their former classmate Richard “Dickie” Byrd throws a high school reunion to gather support for his mayoral campaign, it drums up some not-so-sweet memories for dessert shop proprietor Chase Oliver and her friend Julie Larson. Julie would rather not reconnect with Ron North, the creepy kid who had a crush on her back in the day. His social graces haven’t exactly improved with age, but is he creepy enough to kill? The next day, Chase is in the park testing a new cat harness for Quincy, who quickly proves that he cannot be leashed. But when his escape leads Chase to Ron’s body, the police wonder who else got away. Now, with Julie suspected of murder, Chase must prove her innocence before the real killer plans another fatal reunion. 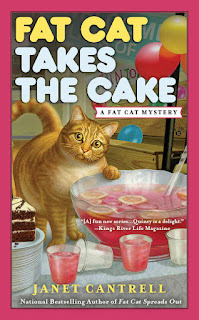 What a great cover for the third in the series--the punch bowl and the look on Quincy's face!! Thanks for stopping by! I love this cover, too. Congratulations on your newest release! This one is coming in April! Thanks. I enjoyed Fat Cat Spreads Out and that was the first one that I read in the series. I intend to read more. I love the picture of Quincy on the covers. I think he may be getting cat hair in the punch, ha ha. I'll bet he IS getting cat hair in the punch. He doesn't actually appear with the punch in the book, but it looks good on the cover. And he appears a lot of other places.